Purchase "Read the End First"
A vacation in Hawai'i turns gruesome when an ancient Hawaiian god returns to purge the islands of humans. Tim joins forces with Alice, an Australian surfer, KImo, a taxi-driver, and Keilani, a pregnant local girl. Together, they hatch a plan to escape the island before they are consumed by cannibal dog-men. "Few anthologies are good this consistently throughout. I did have favorites however. R.B Payne's "Kaupe, God of the Cannibal Dog-Men," and "Best Intentions" by Rebecca Snow fell into that coveted place for me. If you like wonderfully written, end-of-world scenario stories (as I definitely do), then you should give this a read!" 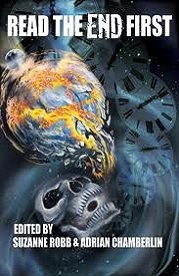 "Read The End First is a wonderful collection of devious and inventive tales about the end of the world. The apocalypse has never before been this much fun!" - NY Times bestseller Jonathan Maberry, author of DEAD OF NIGHT and ASSASIN'S CODE.